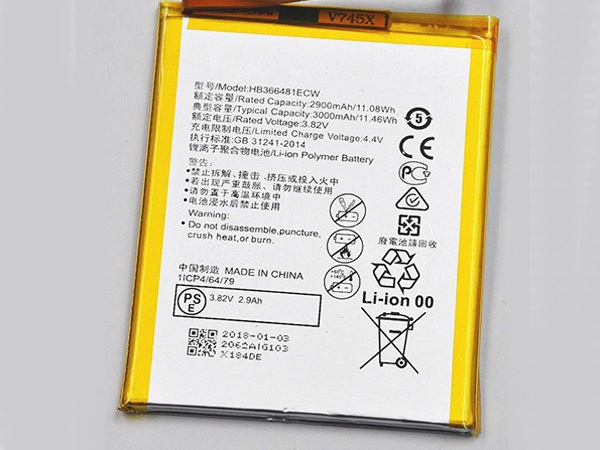 This lithium battery Huawei HB366481ECW smart phone 2900MAH/11.08WH 3.82V, corresponding to the smart phone model Huawei Honor 8 P9 EVA-AL00 AL10 TL00 P9 Lite The battery has undergone rigorous testing and repeated inspections, and the 100% replacement original battery is compatible with the original smart phone. 1 year warranty, 30 day money back guarantee. Do not use a non-original charger or charging cable Whether it’s an Apple phone or an Android phone, the original chargers are standard USB ports and have built-in protection chips. If a third-party nameless charger is used, in order to save costs and produce some chargers without a protection chip, some small accessory manufacturers may have the risk of power instability or excessive current, which may cause damage to the smartphone. .